Today is Monday. M O N D A Y. What more is there to say? I thought about posting a music video of Manic Monday, but didn't find one that I liked. Instead, I figured it would be a good day to promote one of my favorite songs, Into the Ocean, by Blue October. It is October, after all, so it works. Not that I wouldn't be able to post a song by Blue October in May if I wanted to... but, I was really stretching to think of something to post for today and since "Monday" didn't result in finding anything good, I went with the next thing that came to mind - October. 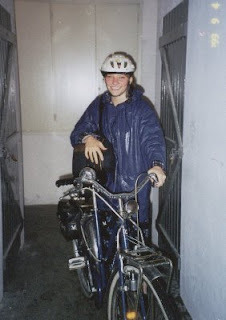 I remember getting stuck in the rain on my bike once while I was on my mission. It was at the end of a really awful day. So many bad things had happened that we stopped counting. Then, we came out of our last appointment at about 9:00pm. It was dark, cold, and when we stepped outside it literally felt like buckets of water were being dumped on our heads. And, we were about a 20 minute bike ride from our apartment. What can you do? Really? So, we hopped on our bikes and started riding home... and the entire time I was thinking, "bring it on!" The worst had already happened... this was nothing after all we'd been through. Having rain makes a greater appreciation for the sun doesn't it? I am so not in the same place. I'm like...hmmm, make it go away. I love rain!! I do!! Heffalump, so true, so true! After a good rain, I just love having the sun come out. Carrot, just so you know, I don't always have the umph to say "bring it on"... sometimes I hide under the covers until I feel ready to come out. Do you want to borrow our covers? Maybe you should come see us. Kaitlin, so do we! We both grew up in places that get about 40 inches of rain a year... and have grown to LOVE the rain.